Last year about this time I spoke to a friend of mine whom I hadn't seen for several weeks and she related their family's latest news...just a few days before she'd made an impromptu trip to the ER with her youngest, then just over a year old. You see, they had only recently moved into her grandmother's (furnished) house and unbeknownst to all, there was a box of rat poison lurking behind a sofa in the sun room. One evening, she walked in to find the finger/footprints of her two boys T (4) and Z (1) in the dust from the poison. She immediately began to feel the panic well up inside of her, but managed to stay calm as she and her husband interrogated T to find out if he had eaten any. He swore that he hadn't and as there was no evidence (coloration around his mouth) he stayed at home with his dad while she whisked little Z to the emergency room. Thankfully - all was okay - no p0ison had been eaten, the box was subsequently disposed of and everyone was safe. 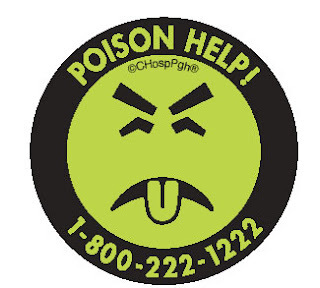 Within a week of hearing her story, I saw a spot on TV talking about Poison Control and that most ER visits for poisonings can actually be avoided with a quick call to Poison Control - hearing that piece of info so close on the heels of her story etched it indelibly on my brain. They said for the most part, the Poison Control operators can assess the situation with the info you provide them and give you the best course of action - typically faster than you can even get to the ER - which could definitely save a life in a desperate situation! I immediately wrote down the number and have made sure to store it in my cell phone, computer contacts and in my home management notebook. I immediately grabbed a couple of envelopes, addressed them and they're now stamped and ready to go out in the morning and I encourage you to do the same! Not only are these stickers free, but they could save the life of one of your loved ones (or you!) and you certainly can't put a price on that! 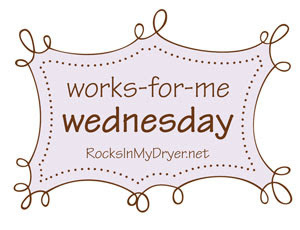 For more great WFMW ideas, head on over to Rocks in my Dryer!